Salthouse lies on the North Norfolk coast between Weybourne and Cley-next-the-Sea. At one time, salt was manufactured in the village and exported to Europe. In fact, its name derives directly from 'house for storing salt' - a term recorded in the Domesday Book. The village church, which is situated on a hill, provides a spectacular view across the marshes to the North Sea. Mary Mings, the daughter of the famous admiral Sir Christopher Mings, is buried beneath the nave. Salthouse has always been prone to flooding - lying, as it does, behind a low shingle bank. The worst inundation in recent years occurred in January 1953. The novelist Sylvia Townsend Warner (1893-1978) rented the Great Eye Folly in Salthouse from 1950 to 1951. She lived here with her partner Valentine Ackland and spent the time working on her last novel The Flint Anchor (1954). 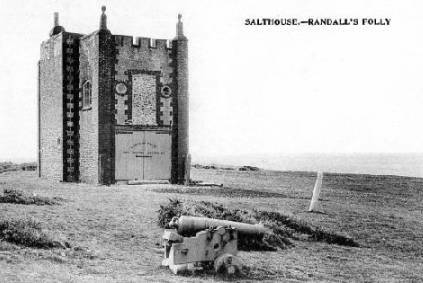 The folly - a former coastguard building - was originally built by Onesiphorous Randall in the 19th Century but was seriously damaged by the great floods of 1953. It stood on the beach in an exposed and windswept location. Nothing remains of it today. Salthouse also features in two memorable poems: the first is by the literary critic John Press (1920- ) who was educated at Cambridge University. In his poem he captures the bleak beauty of the village of the ever-present threat of the sea. Swirls round the marshes and the sun is subdued. Emphasize the silence and the solitude. An aspect of desolation to this village. The whim of Nature contemptuously allows. And the sea would flash with iridescent spume. Which we do not invent but recognise. the anchor that kept him aloft.